You are looking at Rich Bassemir’s desk. If it is true a cluttered desk is a sign of a genius, well…. lets just say Rich is neat. Click on the objects on Rich’s desk to visit his world. 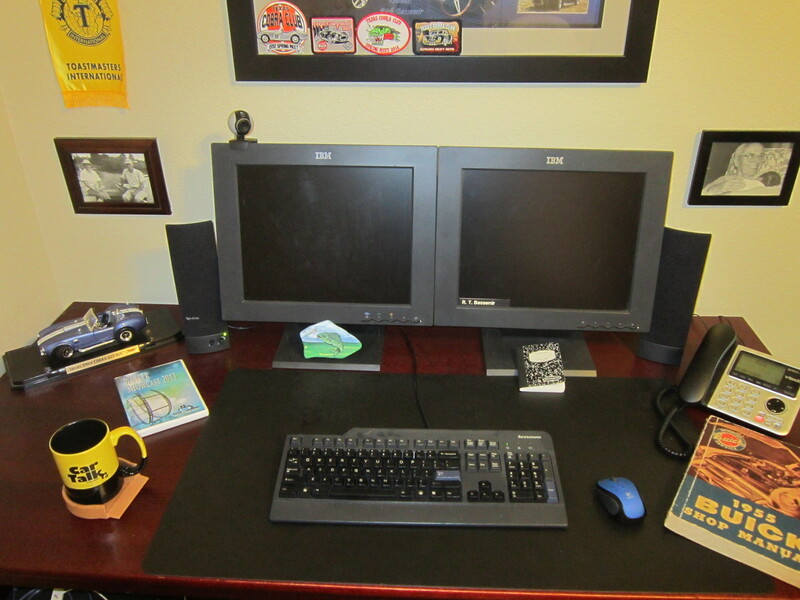 In reality Rich’s desk rarely looks this clear but if I placed an actual picture here only Rich could find anything. Hope you get a laugh or learn something new by exploring the links on this page. Be sure to check out the plans for a transcontinental road trip from Newark, New Jersey to California in celebration of the same trip done in 1916 by CW Tuthill. If you have a burning desire to leave a comment feel free to drop me a note. Your journey has been very exciting and interesting to witness. A true historical event to remember. Thanks for sharing this with all of us. enjoy the trip and DRIVE SLOW! Best of luck. Safe journey.to you both. Deb (Covic)Cox. Hi to your mom from me. good luck, God speed & happy trails! If you let me know where you will be staying in New Paris on the second night we will stop up and see you. That would be nice Ted. I have your number and can let you know where we land after two days of driving (hopefully New Paris). Thank you Bob and thank you for your generous support!! Stay tuned as the adventure unfolds.